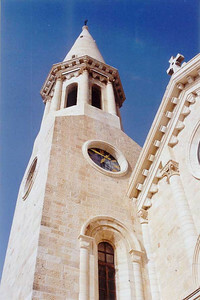 The tower of Christmas Lutheran Church, Bethlehem. 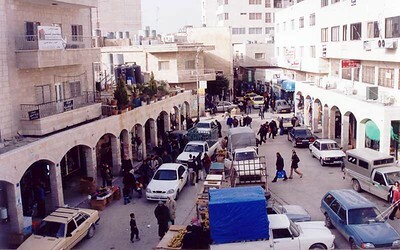 A street scene in Bethlehem, as seen from Christmas Lutheran Church. 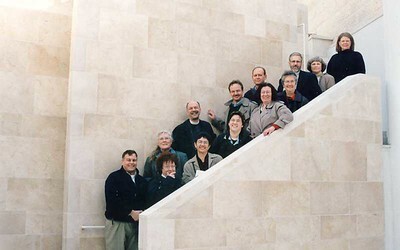 Some students in the telecommunications class at the Lutheran World Federation Vocational Training School, Beit Hanina, Jerusalem, talk with Mark and Marcia Holman. Wael Muhammad Ali, left, describes how his home in the Shu'fat refugee camp was demolished by Israeli authorities. In rear are Mark Holman and Nancy Curtis, and in the right foreground is Tanya Aizikovich from the Israeli Committee Against House Demolition (ICAHD). 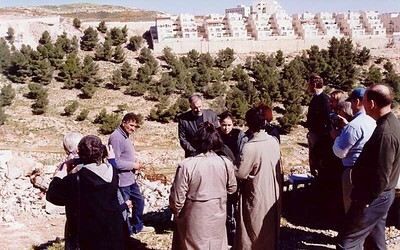 ELCA communicators stand on ruins of homes demolished by Israeli authorities in the Shu'fat Refugee Camp. Demolished homes overlook a new Israeli settlement on Palestinian land. These are students in a kindergarten class at the Lutheran Church of Hope School, Ramallah, West Bank. 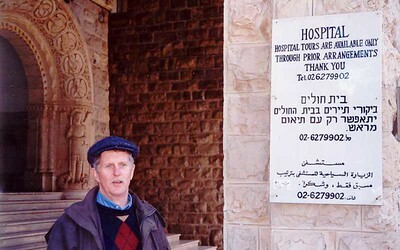 Craig Kippels, Lutheran World Federation representative, Jerusalem, addresses the ELCA group at the Augusta Victoria Hospital on the Mount of Olives. 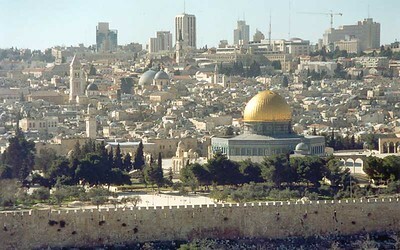 From the Mount of Olives, visitors can see a view of Jerusalem's Old City. The ELCA communicators gather on the stairs at the International Center at Christmas Lutheran Church, Bethlehem.